RealRick’s GUI, in Solo Mode. MusicLab have turned their guitar-modelling attentions to the legendary Rickenbacker. MusicLab’s RealGuitar, RealStrat and RealLPC virtual instruments have proved themselves as more than just convenient replacements for a real guitarist when budgets are tight. They reward practice and familiarity, and are capable of highly expressive and detailed performances; dedicated advocates of these instruments have become quite adept at convincing even real plank-slappers that they are listening to the genuine article. The ‘Real’ series has so far encompassed nylon, steel and 12-string acoustic guitars (RealGuitar), the Fender Stratocaster (RealStrat) and the Les Paul Custom (RealLPC). For anyone unfamiliar with these, it’s worth catching up on previous SOS reviews. As an enthusiastic devotee of these instruments, I was pleased to see that for their fourth product in the series, MusicLab have chosen to model not one, but two Rickenbacker electric guitars: a six-string and a 12-string. It’s a logical choice: the Rickenbacker’s jangle-pop tone is the perfect foil for the wiriness of a Strat and the fuller-bodied tone of a Les Paul. The guitars are presented in six variations; two for the six-string and four for the 12-string. The six-string is the most straightforward, having a choice of mono or stereo versions. The stereo version reproduces the classic Rick-O-Sound, where each pickup is directed to its own output, or in this case panned hard left and right. Fed through an amp simulator with stereo capabilities (eg. Native Instruments Guitar Rig 5) this enables each pickup to be processed with separate amps and effects. As it happens, RealRick comes bundled with IK Multimedia’s Amplitube Custom Shop, which has full stereo capability. 12-String A and 12-String B offer variations on the octave/unison tuning of the string pairs. The A version has the lower four strings (E, A, D, G) tuned in octaves and the upper two (B, E) tuned in unison. The B version differs in having string four (G) tuned in unison. Both these versions are in mono. The stereo A and B 12-strings have the same tunings as the mono versions. However, the implementation of the stereo is somewhat unusual, being confined to the main sustain sound: all other sounds (mutes, scrapes, fret noises, etc.) are in mono, and identical to those of the six-string. Clearly this reduces the sample memory otherwise required, but it is a somewhat strange effect leaping from stereo to mono whenever you change to a non-sustain articulation, especially in headphones. The sustain’s stereo configuration is also unusual, having the two strings that make up the octaves and unisons panned left and right, rather than the Rick-O-Sound panned pickups that you might expect; nevertheless it’s an interesting effect. The pick position selector provides a range of tones from bright and jangly at the bridge end to darkly moody towards the neck. I suspect this is achieved by sample-shifting, together with a crafty fretboard re-mapping algorithm. Pick position combined with the high and low EQ controls provides a fair amount of tonal shaping before RealRick even hits an amp simulator. The fact that the natural delay between string pairs on the 12-string isn’t affected also suggests that each string of a pair was sampled separately, with the appropriate delay set at a constant rate in the software. Optional custom chord voicings can be created and saved, replacing the factory default voicings. These are organised in Banks, so you can create different sets of voicings to suit specific songs.One issue that should be mentioned is the inconsistency of the 12-strings’ octave/unison tuning, both up and down the fretboard and when repeatedly playing single notes. This is largely due to the round-robin randomisation of samples, a feature of all the ‘Real’ instruments, designed to eliminate the machine-gun effect and to add naturalistic tonal variations to the sound. However, it would be unusual on a real-life 12-string for the relative tuning of string pairs to vary so randomly, either with repeated notes or fret position. I also felt that the detuning of the upper E-string was just a bit too wide compared to the other strings, which, coupled with the random inconsistencies, often gives the impression of being slightly out of tune with the rest of the instrument. The problem can be minimised by setting the number of alternate samples to ‘1’, although it’s not ameliorated entirely. RealRick certainly conjures up the spirit of the ’60s, the Beatles, the Byrds and American surf pop, not forgetting the myriad Britpop bands and other purveyors of jangly guitar-based music. As such it’s a very welcome addition to the ‘Real’ family. My only criticism is the aforementioned tuning issues of the 12-string. That said, it still sounds great: the tone is just right, and fed through a compressor and a stereo chorus (I recommend the free Hbasm Stereoizer plug-in) it’s a thing of beauty. Aside from a few basic ‘snapshot’ sampled instruments at the budget end of the scale, there is little to compete with RealRick, either in terms of sound quality, execution or providing both six- and 12-string Rickies. East West’s Fab Four includes a Rickenbacker 12-string, but again not nearly to the same level of detail as RealRick. The mega-detailed behemoth that is Vir2 Electri6ity features a Rickenbacker six-string in its arsenal, but no 12-string. So for the time being, MusicLab appear to have no serious competitors — at least as far as the 12-string is concerned. 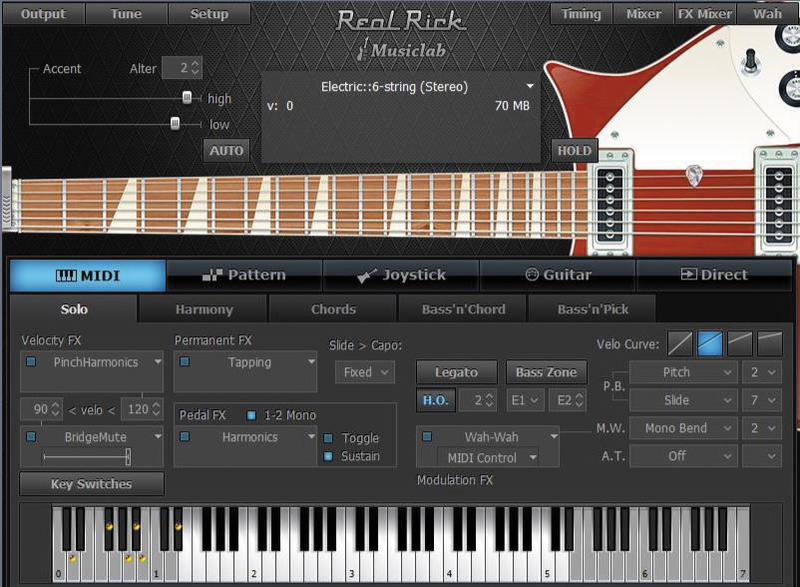 At the time of the 2010 RealLPC review, the software for RealStrat and RealLPC was at version 1.2, with RealGuitar on version 2. Since then, all instruments in the series have been upgraded to version 3, bringing a new GUI, 32/64-bit AAX and VST 3 support and a number of additional features. Two new modes expand upon the standard MIDI keyboard input: Joystick Mode uses ‘Struminator’ technology, allowing performances using Activision’s Guitar Hero controllers. They may be toys, but the video tutorials on MusicLab’s web site demonstrate how incredibly convincing the results can be. Guitar Mode provides individual control of every string on separate MIDI channels, making it ideal for use with guitar-to-MIDI converters. It may seem ironic to use a real guitar to trigger a virtual one, but it opens up numerous possibilities for double-tracking effects, alternative guitar sounds and other experimental approaches. Elsewhere, drop-D and drop-C tunings are possible on the lowest string, whilst new keyswitch articulations include tapping, legato, string select, SlideUp (trigger) and SlideDown (trigger) — these trigger slides up or down from the playing note(s). The modulation wheel can be assigned to activate a variety of articulations, effects and functions — especially useful for temporarily engaging and operating the in-built wah wah with just the one controller. All keyswitch effects parameters are also fully automatable, which avoids having to assign multiple keyswitches to the same effects set to different values. 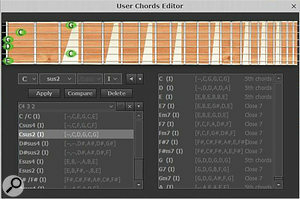 In Chords Mode, chords are normally voiced automatically in the way the software determines. However, sometimes the voicing isn’t quite what you expect or want. 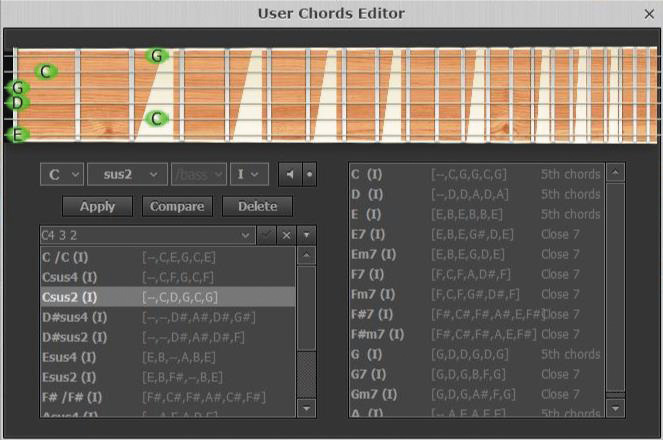 The User Chords editor enables custom voicings to be designed; any number of banks of alternate voicings can be saved, so you always have access to the ones you want. If you’re happy to let the software decide for you, simply select the ‘empty’ bank and RealRick’s algorithms do the rest. Another useful addition is Silent Mode; normally chords sound as soon as you play them on the keyboard. With Silent Mode engaged, chords can be positioned on the keyboard, but no sound (or change of chord) is heard until you play the trigger keys. The classic Rickenbacker sound — a perfect complement to RealStrat and RealLPC. Some tuning inconsistencies on the 12-string guitar. MusicLab journey down Jangle Pop Lane with the Rickenbacker six-string and 12-string electric guitars. Its retro tone complements RealStrat and RealLPC nicely, and should appeal to virtual guitarists looking to broaden their sound palette, especially if they are already au fait with the other MusicLab guitars.